Bed And Breakfast1300 sq. ft.
A lush green private garden of approx. 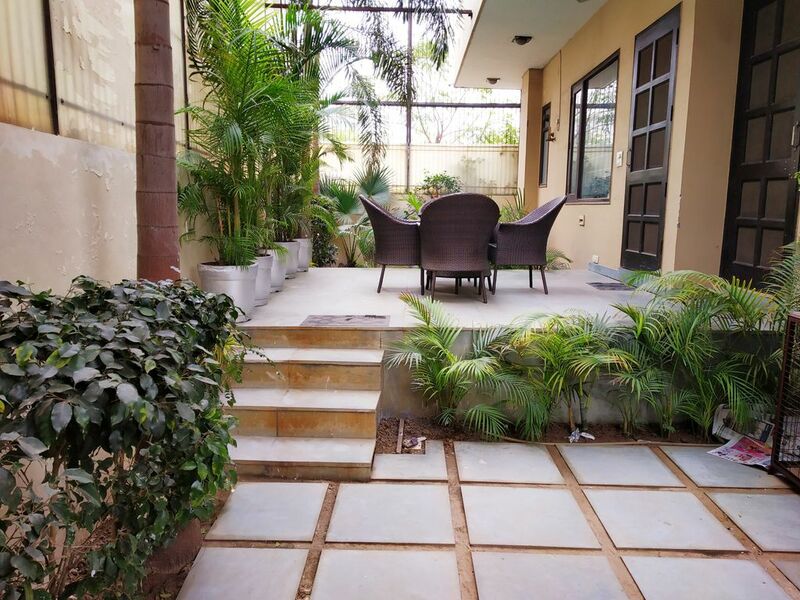 size 1000 with comfortable outdoor seating, perfect to enjoy and relax amidst greenery. 300 sq feet Artistically designed modern bedroom with a luxurious feel & garden view, fall ceiling with lighting effect adds to the warm feel. Spacious king size bed with leather cushion backrest. Equipped with all amenities, T.V, music, book collection, Tea & coffee maker, air-conditioned, free Wifi, attached modern bathroom and wardrobe. The Room is on the Ground Floor and has got separate Private Entry. This is a Modern Luxurious property built tastefully with the exposure I got while traveling to some of the best properties around the world. You have a beautiful garden along with Sitting Area with outdoor furniture. The Garden is attached to your Room. Enjoy your breakfast/Lunch/Dinner surrounded by Palm Trees.